Will Jordan is a Multi-Platinum selling, Grammy-nominated singer, songwriter, and producer, from Tacoma, Washington. He is best known for penning the hook for “Fly” by Nicki Minaj feat. Rihanna. In 2013, he released his debut EP In Case it Rains followed by 2015's Journey to the Land of the Lost EP Trilogy and 2018's EP Deep Sleep. 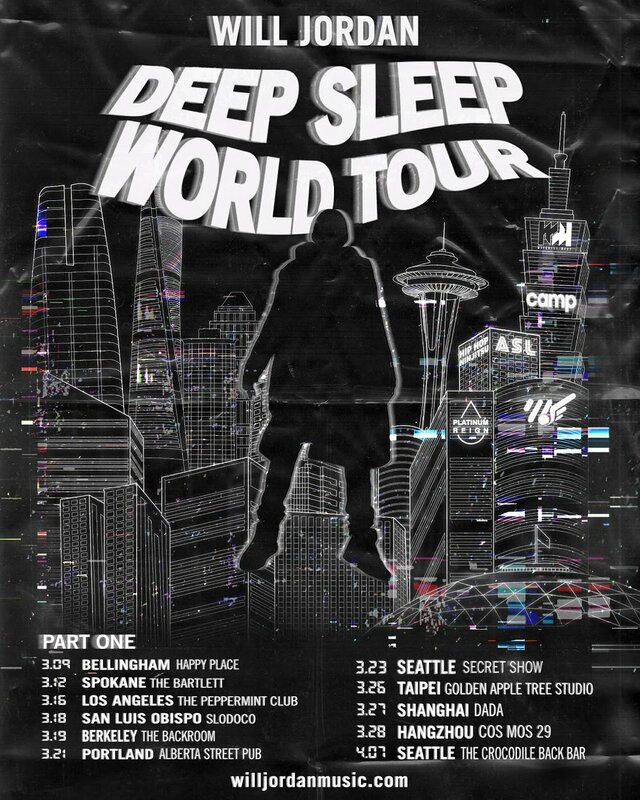 The Deep Sleep World Tour will be promoting its namesake, the Deep Sleep EP, Will Jordan's weekly "Wednesday Friends Day" releases, and the upcoming release of his next project. DSWT is comprised of three parts, adding dates and locations each round. Will Jordan is a Multi-Platinum selling, Grammy-nominated songwriter, artist, and producer, from Tacoma, Washington. He is best known for penning the hook for “Fly” by Nicki Minaj feat. Rihanna. In 2013, he released his debut EP In Case it Rains followed by 2015's Journey to the Land of the Lost EP Trilogy and 2018's EP Deep Sleep. The Deep Sleep World Tour will be promoting its namesake, the Deep Sleep EP, Will Jordan's weekly "Wednesday Friends Day" releases, and the upcoming release of his next project. DSWT is comprised of three parts, adding dates and locations each round. parts, adding dates and locations each round. The Night Show Episode 3: Erica Ramirez, John "P.U.S.H. Gaines, and N.S.B. The Night Show is a live, monthly late program hosted by Will Jordan and Keilani Afalava. Part concert, part game show, part master class, The Night Show showcases local music, local art, and local business, as well as appearances and interviews from nationally recognized guests. This month's show features writer and motivational speaker John "Push" Gaines, esteemed journalist/creative producer Erika Ramirez and live band karaoke with NSB. We'll have complimentary champagne for guests during the first hour (while supplies last) to start off the evening. Throughout the night, we'll have raffle giveaways with special gifts and prizes from other sponsors and partners. And if the night couldn't get any better, it just did with this next statement: It's with great honor to have Grammy-nominated songwriter and producer, Will Jordan, with credits from both Rihanna and Nicki Minaj to perform for us during the Social Club. He has an amazing voice and stage presence. Check out some of his performance compilation footage here. After the Social Club, we'll be at Amber for The Night Cap to celebrate even more! After Two and a half years ... It's finally Finished. Deep sleep is Dropping on my Birthday, April 25th. To celebrate, I'm throwing a concert on May 12th at Alma Mater in Tacoma with Chromatography and Romaro Franceswa, and nothing would make me happier than to see you there! We're shooting a Music Video/Short Film for Euphoria. We want YOU to be in it. Will Jordan and Jessica Domingo at Jazzbones Nov. 17th. Get your tickets, your friends, your dancing shows and get ready! Will Jordan Performance @ Rock The Vote! Please join us on “A Journey of Spices” with Chef Tarik Abdullah of Black and Tan Hall, as he takes us on a culinary adventure, highlighting a specific spice for each course. Northwest leaders, organizers, and creators share the successes and challenges of living and working in the arts, film, and technology. Learn about the opportunities, collaborations, recommendations, and trends impacting film and the arts in the Puget Sound area. Our favorite Seattle bands choose their musical crush, then we host the perfect date. Two bands, one set. Join us for the debut of this exciting concert series. • West African dance and drumming performance by T.U.P.A.C. We will honor the 2017 AMOCAT Arts Award winners and funding recipients starting at 6 pm. It’s all free and open to the public – pack up the family, invite your friends and come help us celebrate! Tune in via radio (90.3 FM) or online (http://kexp.org/) at 6PM Sunday, April 30TH!!! A grammy nominated singer-songwriter and producer from Tacoma, Washington. He penned the hook for "Fly" by Nicki Minaj & Rihanna. In 2013, he released his first EP in Case it Rains which he wrote, produced and performed entirely. Will is currently supporting his Journey To The Land Of The Lost trilogy which contains 3 EPs: Plant City, Limbo, and Land of the Lost. A funky, jazz soul sister with reason. She is an upcoming artist from Tacoma, Washington. Let's ring in the Christmas spirit together again! Because last year's Colossal Soul Holiday Show at The Kelley Farm was a sell out, we've added a second show on the same day. We have many of the same amazing performers from last year along with some great new ones. We're looking forward to making some magic with our Colossal Community again on Sunday, December 4th! Singin' Sisters, Will Jordan, The Cloves, James Coates, Sporty Lee, Faint Peter, Kyle Nacis, Elly Mark, Jake Loden, Jonah Oh, Luke Peterson and Micaela Cooley!